Though not native and the very definition of "weedy looking," Blue Globe Thistle, Echinops ritro, gets a fair amount of pollinator action. That said it's an awful weed and serious measures should be taken to dead head the things. Those leaves are razer sharp and can draw blood. You don't want this escaping into your yard. It really raises a lot of questions as to how it ended being sold as an ornamental. I guess blue flowers are so prized that exceptions are made in the otherwise well manicured ornamental industry. Cup Plant, Silphium perfoliatum, is native but it's also pretty weedy. Plant with caution. a good alternative would be the classic patch of Sunflowers. To give you the idea of how weedy this plant is, I only had 4 of these plants last year.... As you can see they've spread out to form their own clumps just as Goldenrod does. 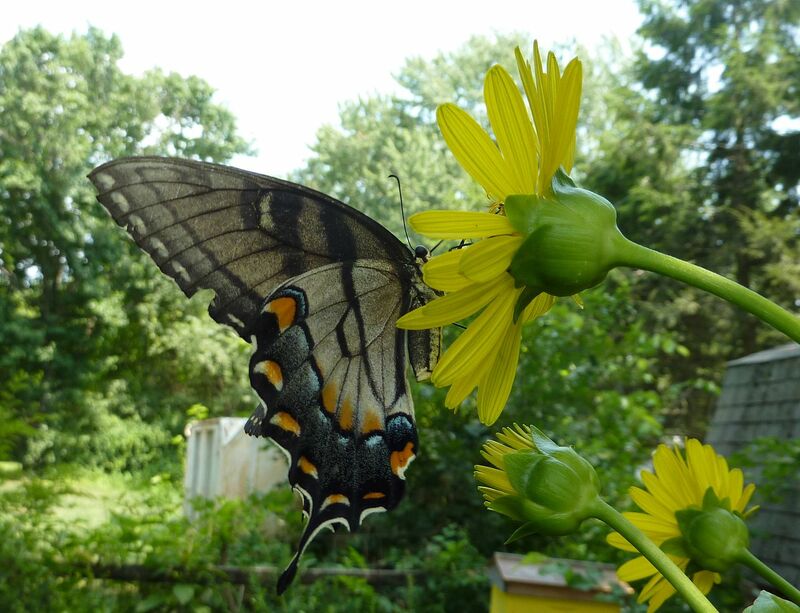 Swallowtail butterflies also love them. Anise Hyssop, Agastache foeniculum, is by far one of the best sources at this time of year. They're a native perennial, will reseed in the right type of soil, and look great in the garden.